For the ship of the same name, see Royal Charter (ship). A royal charter is a formal grant issued by a monarch under royal prerogative as letters patent. Historically, they have been used to promulgate public laws, the most famous example being the British Magna Carta (great charter) of 1215, but since the 14th century have only been used in place of private acts to grant a right or power to an individual or a body corporate. They were, and are still, used to establish significant organisations such as boroughs (with municipal charters), universities and learned societies. Charters should be distinguished from royal warrants of appointment, grants of arms and other forms of letters patent, such as those granting an organisation the right to use the word "royal" in their name or granting city status, which do not have legislative effect. The British monarchy has issued over 1,000 royal charters. Of these about 750 remain in existence. The earliest charter recorded by the UK government was granted to the University of Cambridge in England in 1231, although older charters are known to have existed including to the Worshipful Company of Weavers in England in 1150 and to the town of Tain in Scotland in 1066. Charters continue to be issued by the British Crown, a recent example being that awarded to The Chartered Institute of Ergonomics and Human Factors, in 2014. Charters have been used in Europe since medieval times to grant rights and privileges to towns, boroughs and cities. During the 14th and 15th century the concept of incorporation of a municipality by royal charter evolved. Among the past and present groups formed by royal charter are the Company of Merchants of the Staple of England (13th Century), the British East India Company (1600), the Hudson's Bay Company, the Chartered Bank of India, Australia and China (since merged into Standard Chartered), the Peninsular and Oriental Steam Navigation Company (P&O), the British South Africa Company, and some of the former British colonies on the North American mainland, City livery companies, the Bank of England and the British Broadcasting Corporation (BBC). Between the 14th and 19th centuries, royal charters were used to create chartered companies – for-profit ventures with shareholders, used for exploration, trade and colonisation. Early charters to such companies often granted trade monopolies, but this power was restricted to parliament from the end of the 17th century. Until the 19th century, royal charters were the only means other than an act of parliament by which a company could be incorporated; in the UK, the Joint Stock Companies Act 1844 opened up a route to incorporation by registration, since when incorporation by royal charter has been, according to the Privy Council, "a special token of Royal favour or … a mark of distinction". The use of royal charters to incorporate organisations gave rise to the concept of the "corporation by prescription". This enabled corporations that had existed from time immemorial to be recognised as incorporated via the legal fiction of a "lost charter". Examples of corporations by prescription include Oxford and Cambridge universities. According to the Catholic Encyclopedia, of the 81 universities established in pre-Reformation Europe, 13 were established ex consuetudine without any form of charter, 33 by Papal bull alone, 20 by both Papal bull and imperial or royal charter, and 15 by imperial or royal charter alone. Universities established solely by royal (as distinct from imperial) charter did not have the same international recognition – their degrees were only valid within that kingdom. The first university to be founded by charter was the University of Naples in 1224, founded by an imperial charter of Frederick II. The first university founded by royal charter was the University of Coimbra in 1290, by King Denis of Portugal, which received Papal confirmation the same year. Other early universities founded by royal charter include the University of Perpignan (1349; Papal confirmation 1379) and the University of Huesca (1354; no confirmation), both by Peter IV of Aragon, the Jagiellonian University (1364; Papal confirmation the same year) by Casimir III of Poland, the University of Vienna (1365; Papal confirmation the same year) by Rudolf IV, Duke of Austria, the University of Caen (1432; Papal confirmation 1437) by Henry VI of England, the University of Girona (1446; no confirmation) and the University of Barcelona (1450; Papal confirmation the same year), both by Alfonso V of Aragon, the University of Valence (1452; Papal confirmation 1459) by the Dauphin Louis (later Louis XI of France), and the University of Palma (1483; no confirmation) by Ferdinand II of Aragon. The University of Cambridge was confirmed by a Papal bull in 1317 or 1318, but despite repeated attempts, the University of Oxford never received such confirmation. The three pre-Reformation Scottish universities (St Andrews, 1413; Glasgow, 1451; Aberdeen, 1494) were all established by Papal bulls. Following the reformation, establishment of universities and colleges by royal charter became the norm. The University of Edinburgh was founded under the authority of a royal charter granted to the Edinburgh town council in 1582 by James VI as the "town's college". Trinity College Dublin was established by a royal charter of Elizabeth I (as Queen of Ireland) in 1593. Both of these charters were given in Latin. The Edinburgh charter gave permission for the town council "to build and to repair sufficient houses and places for the reception, habitation and teaching of professors of the schools of grammar, the humanities and languages, philosophy, theology, medicine and law, or whichever liberal arts which we declare detract in no way from the aforesaid mortification" and granted them the right to appoint and remove professors. But, as concluded by Edinburgh's principal, Sir Alexander Grant, in his tercentenary history of the university, "Obviously this is no charter founding a university". Instead, he proposed, citing multiple pieces of evidence, that the surviving charter was original granted alongside a second charter founding the college, which was subsequently lost (possibly deliberately). This would also explain the source of Edinburgh's degree awarding powers, which were used from the foundation of the college. The royal charter of Trinity College Dublin, while being straightforward in incorporating the college, also named it as "mother of a University", and rather than granting the college degree-awarding powers stated that "the students on this College … shall have liberty and power to obtain degrees of Bachelor, Master, and Doctor, at a suitable time, in all arts and faculties". Thus the University of Dublin was also brought into existence by this charter, as the body that awards the degrees earned by students at Trinity College. Following this, no surviving universities were created in the British Isles until the 19th century. The 1820s saw two colleges receive royal charters: St David's College, Lampeter in 1828 and King's College London in 1829. Neither of these were granted degree-awarding powers or university status. The 1830s saw an attempt by University College London to gain a charter as a university and the creation by Act of Parliament of Durham University, but without incorporating it or granting any specific powers. These led to debate about the powers of royal charters and what was implicit to a university. The essence of the debate was firstly whether the power to award degrees was incidental to the creation of a university or needed to be explicitly granted and secondly whether a royal charter could, if the power to award degrees was incidental, limit that power – UCL wishing to be granted a royal charter as "London University" but excluding the power to award degrees in theology due to the secular nature of the institute. Sir Charles Wetherell, arguing against the grant of a royal charter to UCL before the Privy Council in 1835, argued for degree-awarding powers being an essential part of a university that could not be limited by charter. However, Sir William Hamilton, wrote a response to Wetherell in the Edinburgh Review, drawing in Durham University and arguing that the power to award specific degrees had been explicitly granted historically, thus creating a university did not implicitly grant degree-awarding powers. UCL was incorporated by royal charter in 1836, but without university status or degree-awarding powers, which went instead to the University of London, created by royal charter with the explicit power to grant degrees in Arts, Law and Medicine. Durham University was incorporated by royal charter in 1837, but although this confirmed that it had "all the property, rights, and privileges which … are incident to a University established by our Royal Charter" it contained no explicit grant of degree-awarding powers. This was considered sufficient for it to award "degrees in all the faculties", but all future university royal charters explicitly stated that they were creating a university and explicitly granted degree-awarding power. Both London (1878) and Durham (1895) later received supplemental charters allowing the granting of degrees to women, which was considered to require explicit authorisation. After going through four charters and a number of supplemental charters, London was reconstituted by Act of Parliament in 1898. The Queen's Colleges in Ireland, at Belfast, Cork, and Galway, were established by royal charter in 1845, as colleges without degree awarding powers. The Queens University of Ireland received its royal charter in 1850, stating "We do will, order, constitute, ordain and found an University … and the same shall possess and exercise the full powers of granting all such Degrees as are granted by other Universities or Colleges in the faculties of Arts, Medicine and Law". This served as the degree awarding body for the Queen's Colleges until it was replaced by the Royal University of Ireland. The royal charter of the Victoria University in 1880 started explicitly that "There shall be and is hereby constituted and founded a University" and granted an explicit power of awarding degrees (except in medicine, added by supplemental charter in 1883). From then until 1992, all universities in the United Kingdom were created by royal charter except for Newcastle University, which was separated from Durham via an Act of Parliament. Following the independence of the Republic of Ireland, new universities there have been created by Acts of the Oireachtas (Irish Parliament). Since 1992, most new universities in the UK have been created by Orders of Council as secondary legislation under the Further and Higher Education Act 1992, although granting degree-awarding powers and university status to colleges incorporated by royal charter is done via an amendment to their charter. Several of the colonial colleges that predate the American Revolution are described as having been established by royal charter. Except for the The College of William & Mary, which received its charter from King William III and Queen Mary II in 1693 following a mission to London by college representatives, these were either provincial charters granted by local governors (acting in the name of the king) or charters granted by legislative acts from local assemblies. The first charters to be issued by a colonial governor on the consent of their council (rather than by an act of legislation) were those granted to Princeton University (as the College of New Jersey) in 1746 (from acting governor John Hamilton) and 1748 (from Governor Jonathan Belcher). There was concern as to whether a royal charter given by a governor in the King's name was valid without royal approval. An attempt to resolve this in London in 1854 ended inconclusively when Henry Pelham, the prime minister, died. However, Princeton's charter was never challenged in court prior to its ratification by the state legislature in 1880, following the US Declaration of Independence. Similarly, Columbia University received its royal charter (as King's College) in 1754 from Lieutenant Governor James DeLancey of New York, Rutgers University received its (as Queen's College) in 1766 (and a second charter in 1770) from Governor William Franklin of New Jersey, and Dartmouth College received its in 1769 from Governor John Wentworth of New Hampshire. The case of Dartmouth College v. Woodward, heard before the Supreme Court of the United States in 1818 centred on the status of the college's royal charter. The court found in 1819 that the charter was a contract under the Contract Clause of the US Constitution, meaning that it could not be impaired by state legislation, and that it had not been dissolved by the revolution. The charter for the College of William and Mary specified it to be a "place of universal study, or perpetual college, for divinity, philosophy, languages and other good arts and sciences", but made no mention of the right to award degrees. The Princeton charter, however, specified that the college could "give and grant any such degree and degrees … as are usually granted in either of our universities or any other college in our realm of Great Britain". Columbia's charter used very similar language a few years later, as did Dartmouth's charter. The charter of Rutger uses quite different words, specifying that it may "confer all such honorary degrees as usually are granted and conferred in any of our colleges in any of our colonies in America". Of the other colleges founded prior to the American Revolution, Harvard College was established in 1636 by Act of the Great and General Court of the Massachusetts Bay Colony and incorporated in 1650 by a charter from the same body, Yale University was established in 1701 by Act of the General Assembly of Connecticut, the University of Pennsylvania received a charter from the proprietors of the colony in 1753, Brown University was established in 1764 (as the College of Rhode Island) by an Act of the Governor and General Assembly of Rhode Island, and Hampden-Sydney College was established privately in 1775 but not incorporated until 1783. A number of Canadian universities and colleges were founded or reconstituted under Royal Charter in the 19th century, prior to confederation in 1867. Most Canadian universities originally established by royal charter were subsequently reincorporated by acts of legislature. The University of King's College was founded in 1789 and received a royal charter in 1802 naming it, like Trinity College Dublin, "the Mother of an University" and granting it the power to award degrees. The charter remains in force. McGill University was established under the name of McGill College in 1821 by a provincial royal charter issued by Lord Dalhousie as Governor General of British North America, which stated that the "College shall be deemed and taken to be an University" and should have the power to grant degrees. It was reconstituted by a Royal Charter issued in 1852 by Queen Victoria, which remains in force. The University of New Brunswick was founded in 1785 as the Academy of Liberal Arts and Sciences and received a provincial charter as the College of New Brunswick in 1800. 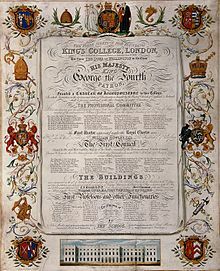 In the 1820s it began giving university-level instruction and received a Royal Charter under the name "King's College" as a "College, with the style and privileges of an University" in 1827. The college was reconstituted as the University of New Brunswick by an act of legislature in 1859. The University of Toronto was founded by royal charter in 1827 under the name of King's College as a "College, with the style and privileges of an University", but did not open until 1843. The charter was subsequently revoked and the institution replaced by the University of Toronto in 1849 under provincial legislation. Victoria University, a college of the University of Toronto, opened in 1832 under the name of the Upper Canada Academy giving "pre-university" classes and received a royal charter in 1836. In 1841 a provincial act replaced the charter, reconstituted the academy as Victoria College, and granted it degree-awarding powers. Another college of Toronto, Trinity College, was incorporated by an act of legislature in 1851 and received a royal charter in 1852 stating that it "shall be a University and shall have and enjoy all such and the like privileges as are enjoyed by our Universities of our United Kingdom of Great Britain and Ireland". Queen's University was established by Royal Charter in 1841. This remains in force as the university's primary constitutional document and was last amended, through the Canadian federal parliament, in 2011. Laval University was founded by Royal Charter in 1852, which granted it degree awarding powers and started that it would "have, posess and enjoy all such and the like privileges as are enjoyed by our Universities of our United Kingdom of Great Britain and Ireland". This was replaced by a new charter from the National Assembly of Quebec in 1971. Bishop's University was founded, as Bishop's College, by an Act of Canadian Parliament in 1843 and received a royal charter in 1853 granting it the power to award degrees and stating that "said College shall be deemed and taken to be a University, and shall have and enjoy all such and the like privileges as are enjoyed by our Universities of our United Kingdom of Great Britain and Ireland". The University of Ottawa was established in 1848 as the College of Bytown. It received a Royal Charter under the name College of Ottawa raising it to university status in 1866. Guilds and livery companies are among the earliest organisations recorded as receiving royal charters. The Privy Council list has the Saddlers Company in 1272 as the earliest, followed by the Merchant Taylors Company in 1326 and the Skinners Company in 1327. The earliest charter to the Saddlers Company gave them authority over the saddlers trade; it was not until 1395 that they received a charter of incorporation. The Merchant Taylors were similarly incorporated by a subsequent charter in 1408. Royal charters gave the first regulation of medicine in England. In 1462 the Barbers Company received the earliest known charter concerning surgery, charging them with the superintendence, scrutiny, correction and governance of surgeons in the City of London and its suburbs. A further charter in 1540 to the renamed Company of Barber-Surgeons specified separate classes of surgeons, barber-surgeons, and barbers. The Company of Surgeons separated from the barbers in 1745, eventually leading to the establishment of the Royal College of Surgeons by royal charter in 1800. The Royal College of Physicians of London was established by royal charter in 1518 and charged with regulating the practice of medicine in the City of London and within seven miles of the city. The Royal College of Physicians of Ireland was established by royal charter in 1667 and the Royal College of Surgeons in Ireland in 1784. The Royal Society was established in 1660 as Britain's first learned society and received its first royal charter in 1662. It was reincorporated by a second royal charter in 1663, which was then amended by a third royal charter in 1669. These were all in Latin, but a supplemental charter in 2012 gave an English translation to take precedence over the Latin text. The Royal Society of Edinburgh was established by royal charter in 1783 and the Royal Irish Academy was established in 1785 and received its royal charter in 1786. New professional bodies were formed in Britain in the early 19th century representing new professions that arose after the industrial revolution and the rise of laissez-faire capitalism. These new bodies sought recognition by gaining royal charters, laying out their constitutions and defining the profession in question, often based on occupational activity or particular expertise. To their various corporate objectives, these bodies added the concept of working in the public interest that was not found in earlier professional bodies. This established a pattern for British professional bodies, and the 'public interest' has become a key test for a body seeking a royal charter. Royal charters were previously used in Australia to incorporate non-profit organisations. However, since at least 2004 this has not been a recommended mechanism. The royal decree is the equivalent in Belgium of a Royal Charter. In the period before 1958, 32 higher education institutes had been created by royal charter. These were typically engineering or technical institutions rather than universities. Since the Belgian state reform of 1988–1989, competency over education was transferred to the federated entities of Belgium. Royal decrees can therefore no longer grant higher education institution status or university status. In Canada, there are a number of organisations that have received Royal Charters. However, the term is often applied incorrectly to organisations, such as the Royal Astronomical Society of Canada, that have been granted the use of a royal title rather than a royal charter. The Canada Company, incorporated by Act of Parliament in June 1825. Royal Charter was issued in August 1826 to purchase and develop lands. Purchased the Crown Reserve of 1,384,413 acres and a special grant of 1,100,000 acres in the Huron County area. The Royal Life Saving Society of Canada, founded 1891 and received royal patronage and style 1904. Royal Charter granted in 1924 by King George V.
The Boy Scouts Association founded in 1910; incorporated by royal charter in 1912; Canadian General Council, now called Scouts Canada, formed in 1914 and incorporated by Act of the Canadian Parliament in 1914. Cities under Royal Charter are not subject to municipal Acts of Parliament applied generally to other municipalities, and instead are governed by legislation applicable to each city individually. The Royal Charter codifies the laws applied to the particular city, and lays out the powers and responsibilities not given to other municipalities in the province concerned. Several Canadian private schools were founded or reconstituted under Royal Charter. The Institution of Engineers was incorporated by royal charter in 1935. A number of Irish institutions were established by or received royal charters prior to Irish independence. These are no longer under the jurisdiction of the British Privy Council and their charters can thus only be altered by a Charter or Act of the Oireachtas (Irish Parliament). The University of South Africa received a Royal Charter in 1877. The Royal Society of South Africa received a Royal Charter in 1908. Royal charters continue to be used in the United Kingdom to incorporate charities and professional bodies, to raise districts to Borough status, and to grant university status and degree awarding powers to colleges previously incorporated by royal charter. Most new grants of Royal Charters are reserved for eminent professional bodies, learned societies or charities "which can demonstrate pre-eminence, stability and permanence in their particular field". The body in question has to demonstrate not just pre-eminence and financial stability but also that bringing it under public regulation in this manner is in the public interest. In 2016, the decision to grant a royal charter to the (British) Association for Project Management (APM) was challenged in the court by the (American) Project Management Institute (PMI), who feared it would give a competitive advantage to APM and claimed the criteria had not been correctly applied; the courts ruled that while the possibility of suffering a competitive disadvantage did give PMI standing to challenge the decision, the Privy Council was permitted to take the public interest (in having a chartered body promoting the profession of project management) into account as outweighing any failure to meet the criteria in full. A list of UK chartered professional associations can be found here. Individual chartered designations, such as chartered accountant or chartered engineer, are granted by some chartered professional bodies to individual members that meet certain criteria. The Privy Council's policy is that all chartered designations should be broadly similar, and most require Master's level qualifications (or similar experience). In January 2007, the UK Trade Marks Registry refused to grant protection to the American Chartered Financial Analyst trademark, as the word "chartered" in the UK is associated with royal charters, thus its use would be misleading. "Charter" and "chartered" continue to be "sensitive words" in company names, requiring evidence of a royal charter or (for "chartered") permission from a professional body operating under royal charter. The use of "chartered" in a collective trade mark similarly requires the association applying for the mark to have a royal charter as otherwise "the mark would mislead the public into believing that the association and its members have chartered status". Unlike other royal charters, a charter to raise a district to borough status is issued using statutory powers under the Local Government Act 1972 rather than by the royal prerogative. The company registration number of a corporation with a royal charter is prefixed by "RC" for companies registered in England and Wales, "SR" for companies registered in Scotland, and "NR" for companies registered in Northern Ireland. However, many chartered corporations from outside England have an RC prefix from when this was used universally. The BBC operates under a Royal Charter which lasts for a period of ten years, after which it is renewed. Royal charters have not been issued in the US since independence. Those that existed prior to that have the same force as other charters of incorporation issued by state or colonial legislatures. Following Dartmouth College v. Woodward, they are "in the nature of a contract between the state, the corporation representing the founder, and the objects of the charity". Case law indicates that they cannot be changed by legislative action in a way that impairs the original intent of the founder, even if the corporation consents. ^ Charter. The Supplement to the Penny Cyclopaedia of the Society for the Diffusion of Useful Knowledge. 1. Society for the Diffusion of Useful Knowledge. 1845. pp. 331–332. ^ "Magna Carta 1215". British Library. Retrieved 3 February 2019. ^ Peter Crooks (July 2015). "Exporting Magna Carta: exclusionary liberties in Ireland and the world". History Ireland. 23 (4). ^ "Granting arms". College of Arms. Retrieved 3 February 2019. ^ a b c "Chartered bodies". Privy Council. Retrieved 3 February 2019. ^ "Guidance: Applications for Protected Royal Titles" (PDF). royal.uk. Retrieved 3 February 2019. ^ "Chelmsford to receive Letters Patent granting city status". BBC News. 6 June 2012. ^ "List of chartered bodies". Privy Council. Retrieved 30 January 2019. ^ "Guide to the Worshipful Company of Weavers Charter 1707". University of Chicago. Retrieved 30 January 2019. ^ "History and Heritage". Visit Tain. Retrieved 30 January 2019. ^ "CIEHF Documents". The Chartered Institute of Ergonomics and Human Factors. Retrieved 3 February 2019. ^ British Borough Charters. Cambridge University Press. 1923. pp. 25–26. ^ BBC Trust | Charter and Agreement. ^ James Bohun (1993). "Protecting Prerogative: William III and the East India Trade Debate, 1689–1698". Past Imperfect: 63–86. ^ M. S. Rix (September 1945). "Company Law: 1844 and To-Day". The Economic Journal. Wiley/Royal Economic Society. 55 (218/219): 242–260. JSTOR 2226093. ^ "Royal charter". Turcan Connell. Retrieved 3 February 2019. ^ John William Willcock (1827). The Law of Municipal Corporations. J.S.Littell. pp. 21–25. ^ "Legal status of the University". Statutes and Regulations. University of Oxford. Retrieved 4 February 2019. ^ "The University as a charity". University of Cambridge. Retrieved 4 February 2019. ^ Edward Pace (1912). Universities. Catholic Encyclopedia. Robert Appleton Company. The founders: popes and civil rulers – via new adventure.org. ^ a b Osmo Kivinen; Petri Poikus (September 2006). "Privileges of Universitas Magistrorum Et Scolarium and Their Justification in Charters of Foundation from the 13th to the 21st Centuries". Higher Education. 52 (2): 185–213. JSTOR 29735011. ^ James Heywood (1840). Papal Bull to the University of Cambridge. Collection of Statutes for the University and the Colleges of Cambridge. William Clowes and Sins. p. 45. ^ "The founding of the ancient Scottish Universities". University of St Andrews. Retrieved 6 February 2019. ^ Jos. M. M. Hermans; Marc Nelissen, eds. (2005). Charters of Foundation and Early Documents of the Universities of the Coimbra Group. Leuven University Press. pp. 109–111. ^ "Charter by King James VI, 14 April 1582". University of Edinburgh. Retrieved 8 February 2019. ^ Sir Alexander Grant (1884). The Story of the University of Edinburgh During Its First Three Hundred Years. 1. Longmans, Green, and Company. p. 123. ^ Sir Alexander Grant (1884). The Story of the University of Edinburgh During Its First Three Hundred Years. 1. Longmans, Green, and Company. pp. 107–132. ^ Sir Alexander Grant (1884). The Story of the University of Edinburgh During Its First Three Hundred Years. 1. Longmans, Green, and Company. p. 143. ^ "Charter of Queen Elizabeth I" (English; translated from Latin). Trinity College Dublin. Retrieved 10 February 2019. ^ a b "Legal FAQ". Trinity College Dublin. Retrieved 10 February 2019. ^ Christopher Palles (1907). Note by the Lord Chief Baron on the relation between the College and the University. Royal Commission on Trinity College, Dublin, and the University of Dublin: Final Report of the Commissioners. ^ Charles Wetherell. Substance of the Speech of Sir Charles Wetherell: Before the Lords of the Privy Council, on the Subject of Incorporating the London University. pp. 77–82. It will be necessary to examine this subject a little more minutely, and particularly with reference to the power of conferring degrees, and the nature of a university. The only place where I can find any legal discussion on matters so little brought under consideration as these, is the argument of Mr. Attorney General Yorke, in Dr. Bentley's case, which is reported in 2nd Lord Raymond, 1345 ... In this proposition of Mr. Yorke two principles are laid down. The first is that 'granting degrees flows from the Crown;' and the second is, that if 'a University be erected, the power of granting degrees is incidental to the grant.' ... The subject matter granted, is the power of covering degrees; an emanation, as Mr. Yorke expresses it, from the Crown. It is the concession of this power that constitutes the direct purpose and the essential character of a University. … This question of law arises:– How can this anomalous and strange body be constituted in the manner professed? It is to be a "University," but degrees in theology it is not to give. But Mr. Attorney-General Yorke tells us, that the power of giving degrees is incidental to the grant. If this be law, is not the power of conferring theological degrees equally incident to the grant, as other degrees; and if this be so, how can you constitute a University without the power of giving “all” degrees: The general rule of law undoubtedly is, that where a subject matter is granted which has legal incidents belonging to it, the incidents must follow the subject granted; and this is the general rule as to corporations; and it has been decided upon that principle, that as a corporation, as an incident to its corporate character, has a right to dispose of its property, a proviso against alienation is void. ^ Sir William Hamilton. Discussions on philosophy and literature, education and university reform. Edinburgh Review. p. 492. But when it has been seriously argued before the Privy Council by Sir Charles Wetherell, on behalf of the English Universities … that the simple fact of the crown incorporating an academy under the name of university, necessarily, and in spite of reservations, concedes to that academy the right of granting all possibly degrees; nay when (as we are informed) the case itself has actually occurred, – the "Durham University," inadvertently, it seems, incorporated under that title, being in the course of claiming the exercise of this very privilege as a right, necessarily involved in the public recognition of the name: — in these circumstances we shall be pardoned a short excursus, in order to expose the futility of the basis on which this mighty edifice is erected. ^ "Royal Charter". Durham University. Retrieved 10 February 2019. ^ Universities. Encyclopedia Britannica. 21. Black. 1860. p. 471. ^ "History of the University". The Historical Record (1836–1912). University of London. 1912. pp. 7–24. ^ The Queen's University Calendar. Queens University (Ireland). 1859. p. 16. ^ The Victoria University Calendar. 1882. pp. 6–7. ^ Mordechai Feingold, ed. (12 September 2002). "Review Essay". History of Universities: Volume XVII 2001–2002. Oxford University Press. p. 192. ^ John MacLean (1877). History of the College of New Jersey, at Princeton. pp. 79–82 – via Lulu.com (2006). ^ Robert McCaughey (22 October 2003). Stand, Columbia: A History of Columbia University. Columbia University Press. p. 21. ^ Thomas J. Frusciano (2006). "A Historical Sketch of Rutgers University: Section 1". Rutgers University Libraries. The Founding of Queen's College. Retrieved 6 February 2019. ^ "College Charter Granted". Dartmouth College. Retrieved 6 February 2019. ^ "Dartmouth College Case Decided By the U.S. Supreme Court". Dartmouth College. Retrieved 6 February 2019. ^ "Trustees of Dartmouth Coll. v. Woodward, 17 U.S. 518 (1819)". Justia. Retrieved 6 February 2019. ^ Elsie Worthington Clews Parsons (1899). Educational Legislation and Administration of the Colonial Governments. Macmillan. pp. 361–378. ^ Elsie Worthington Clews Parsons (1899). Educational Legislation and Administration of the Colonial Governments. Macmillan. p. 330. ^ Elsie Worthington Clews Parsons (1899). Educational Legislation and Administration of the Colonial Governments. Macmillan. p. 269. ^ Elsie Worthington Clews Parsons (1899). Educational Legislation and Administration of the Colonial Governments. Macmillan. p. 182. ^ Elsie Worthington Clews Parsons (1899). Educational Legislation and Administration of the Colonial Governments. Macmillan. p. 342. ^ "The Harvard Charter of 1650". Harvard University. Retrieved 6 February 2019. ^ "Governance Documents". Yale University. Retrieved 6 February 2019. ^ Elsie Worthington Clews Parsons (1899). Educational Legislation and Administration of the Colonial Governments. Macmillan. p. 300. ^ "College Charter Granted". Brown University. Retrieved 6 February 2019. ^ "History of Hampden-Sydney College" (PDF). Hampden-Sydney College. Retrieved 6 February 2019. ^ Henry Youle Hind (1890). The University of King's College, Windsor, Nova Scotia: 1790–1890. Church Review Company. pp. 26–30. ^ "History". University of King's College. Retrieved 16 February 2019. ^ "King's College Act". NSLegislature.ca. 3 December 1998. Retrieved 16 February 2019. The Royal Charter, bearing date May 12, 1802, granted by His Majesty King George III, authorizing the "Governors, President and Fellows of King's College at Windsor in the Province of Nova Scotia" to confer degrees, is not affected by this Act, except in so far as may be necessary to give effect to this Act. ^ "1821 Charter". McGill University. Retrieved 16 February 2019. ^ "1852 Charter". McGill University. Retrieved 16 February 2019. ^ "King's College, New-Brunswick, January 1, 1829. Inauguration of the Chancellor". The New-Brunswick Religious and Literary Journal. 1: 4–7. 1829. ^ "UNB's Heraldic Tapestries". University of New Brunswick. Retrieved 16 February 2019. ^ "The University's original charter". University of Toronto. Retrieved 15 February 2019. ^ "The Cobourg Years: 1829–1849". Victoria University. Retrieved 15 February 2019. ^ Thomas Arthur Reed. A History of the University of Trinity College, Toronto, 1852–1952. University of Toronto Press. pp. 48–49. ^ Nancy Dorrance (2018). "The Queen's royal charter". Queen's Alumni Review. Queen's University. ^ Copy of the Charter for Erecting the Seminary of Quebec into an University. Accounts and Papers of the House of Commons. 1856. ^ "Origin and history". Laval University. Retrieved 17 February 2019. ^ "1843–1853". Bishop's University. Retrieved 17 February 2019. ^ "Brief history". University of Ottawa Archives. Retrieved 17 February 2018. ^ "The Development of the Company". Worshipful Company of Saddlers. Retrieved 19 February 2019. ^ "About the Company". Worshipful Company of Merchant Taylors. Retrieved 19 February 2019. ^ James Paterson Ross (June 1958). "From Trade Guild to Royal College". Annals of the Royal College of Surgeons of England. 22 (6): 416–422. PMC 2413659. PMID 19310142. ^ "Timeline". Royal College of Physicians of London. Retrieved 23 February 2019. ^ "History of RCPI". Royal College of Physicians of Ireland. Retrieved 30 January 2019. ^ "History of RCSI". Royal College of Surgeons of Ireland. Retrieved 30 January 2019. ^ "Supplemental charter" (PDF). The Royal Society. 2012. Retrieved 23 February 2019. ^ "History". Royal Irish Academy. Retrieved 30 January 2019. ^ Simon Foxell (21 August 2018). Professionalism for the Built Environment. Routledge. pp. 114–125. ^ "What is an Organisation formed by Royal Charter or by Special Act of Parliament?". Better Boards. 20 August 2013. Retrieved 4 February 2019. ^ a b "Royal Charter of the University of Sydney". Archived from the original on 24 March 2012. Retrieved 2 January 2019. ^ V, George (1 August 2018). "Letters Patent granted to the University of Tasmania, signed 30th August 1915". eprints.utas.edu.au. ^  When is an institution considered a recognised higher education institution or a university? ^ R.A. Rosenfeld (17 July 2013). "The Society's "Royal" Charter". Royal Astronomical Society of Canada. Retrieved 13 February 2019. ^ a b Armstrong, Frederick H. (1 September 1985). Handbook of Upper Canadian Chronology: Revised Edition By Frederick H. Armstrong 1841. ISBN 9781770700512. Retrieved 28 July 2014. ^ "The Canadian Encyclopedia: Literary and Historical Society of Quebec". Retrieved 11 December 2014. ^ "History". Royal Society of Canada. Retrieved 1 February 2019. ^ "Chronological timelines". Royal Life Saving Society of Canada. Archived from the original on 15 August 2016. ^ a b "Corporate Collections > Reference > The Charter". Hudson's Bay Company. Retrieved 14 June 2007. ^ The Royal Commonwealth Society: Values of the Royal Commonwealth Society Archived 6 July 2011 at the Wayback Machine. Rcs.ca (4 January 2007). Retrieved 2 May 2012. ^ Royal Academy of Dance Canada: About us Archived 5 July 2008 at the Wayback Machine. Radcanada.org. Retrieved 2 May 2012. ^ Canada4Life; Nova Scotia Archived 4 October 2008 at the Wayback Machine. Canada4life.ca. Retrieved 2 May 2012. ^ Canada's Cities: Unleash our Potential Archived 17 July 2010 at the Wayback Machine. Canadascities.ca (1 September 2001). Retrieved 2 May 2012. ^ Text of letters patent (royal charter) of incorporation, dated 9 September 1935. Retrieved 8 July 2011. ^ "Celebrating 145 years". University of South Africa. Retrieved 30 January 2019. ^ "Brief History". Royal Society of South Africa. 5 July 2012. ^ "Royal Charters". Privy Council. Retrieved 20 February 2019. ^ "Applying for a Royal Charter". Privy Council. Retrieved 20 February 2019. ^ "Court of Appeal dismisses judicial review challenge to grant of Royal Charter". Withers. 30 June 2016. Retrieved 20 February 2019. ^ a b "Chartered bodies". Privy Council. Retrieved 20 February 2019. ^ Allan James (31 October 2006). "Trade mark application No 2226144 by the CFA Institute to register the following trade mark in class 36 and opposition to the registration under No 91541 by the Chartered Insurance Institute" (PDF). Retrieved 6 February 2019. ^ "Annex A: Sensitive words and expressions specified in regulations that require the prior approval of the Secretary of State to use in a company or business name". Companies House. 9 August 2018. Retrieved 20 February 2019. ^ "Certification and collective marks". Trade marks manual. Intellectual Property Office. 14 January 2019. Retrieved 20 February 2019. ^ "Company Registration Number Formats". HMRC.gov.uk. Retrieved 30 January 2019. ^ Gordon R. Clapp (February 1934). "The College Charter". The Journal of Higher Education. Taylor and Francis. 5 (2): 79–87. JSTOR 1975942.